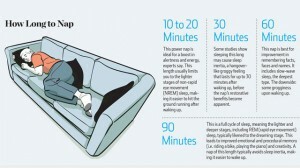 There can be some great benefits to catching a nap during the day. Power Napping can give different results depending on how long you nap. For cognitive memory processing, however, a 60-minute nap may do more good. Including slow-wave sleep helps with remembering facts, places and faces. The downside: some grogginess upon waking. Finally, the 90-minute nap will likely involve a full cycle of sleep, which aids creativity and emotional and procedural memory, such as learning how to ride a bike. Waking up after REM sleep usually means a minimal amount of sleep inertia.